Shrek is a computer-animated film adaptation of William Steig's 1990 fairy tale picture book of the same name. It was directed by New Zealander Andrew Adamson and animated by DreamWorks Animation SKG in May 2001. 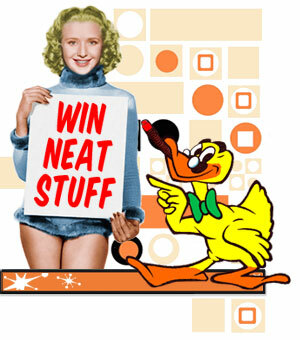 It was the first film to win an Academy Award for Best Animated Feature, a category introduced in 2002. 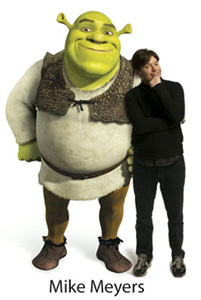 The film features the voices of Mike Myers as a quiet, erratic large green ogre named Shrek, Cameron Diaz as the beautiful and feisty Princess Fiona, Eddie Murphy as a talkative donkey named Donkey, and John Lithgow as the villainous Lord Farquaad. The voice of Shrek was originally recorded by Chris Farley. After his death, Mike Myers was brought on to replace him. After Myers had completed providing the voice for the character and the movie was well into production, he asked to be allowed to re-record all of his lines in a Scottish accent similar to the one his mother used when she told him bedtime stories. Myers had also employed this character voicing for a skit during his Saturday Night Live tenure, and also for the character Stuart MacKenzie in the motion picture So I Married an Axe Murderer. It was critically acclaimed as an animated film worthy of adult interest, with many adult-oriented jokes and themes but a simple enough plot and humor to appeal to children. 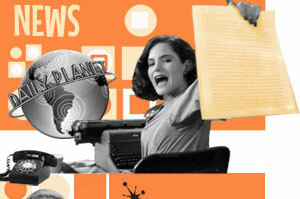 It made notable use of pop musicthe soundtrack includes music by Smash Mouth, The Proclaimers, Jason Wade, The Baha Men, and Rufus Wainwright. The film was extremely successful on release in 2001 and it helped establish DreamWorks as a prime competitor to Walt Disney Pictures in the field of feature film animation, particularly in computer animation. Furthermore, Shrek was made the mascot for the company's animation productions. 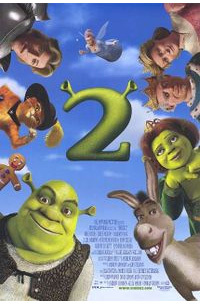 Shrek 2, which was released in the United States on May 19, 2004, is the 2004 sequel to the 2001 computer-animated DreamWorks Pictures film Shrek. In April 2004, the film was selected for competition at the 2004 Cannes Film Festival. There are more Shrek movies to follow, according to Jeffrey Katzenberg: "We didn't have the guts to tell anybody when we started out, [but] we have two more chapters to tell. 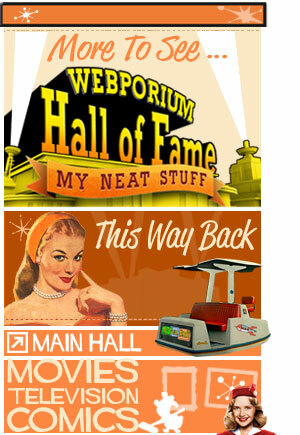 Not unlike Peter Jackson did with The Lord of the Rings. 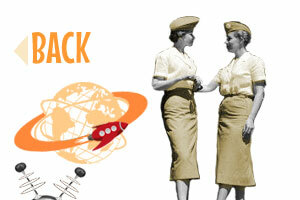 The difference is they did have the guts to make all three of them 'back-to-back-to-back'". The newlywed Shrek and Princess Fiona are invited to Fiona's former kingdom, Far Far Away, to have the marriage blessed by Fiona's parents--which Shrek thinks is a bad, bad idea, and he's proved right: The parents are horrified by their daughter's transformation into an ogress, a fairy godmother wants her son Prince Charming to win Fiona, and a feline assassin is hired to get Shrek out of the way. The computer animation is more detailed than ever, but it's the acting that make the comedy work--in addition to the return of Mike Myers, Eddie Murphy, and Cameron Diaz, Shrek 2 features the flexible voices of Julie Andrews (Mary Poppins), John Cleese (Monty Python's Flying Circus), Antonio Banderas (Desperado), and Jennifer Saunders (Absolutely Fabulous) as the gleefully wicked fairy godmother. 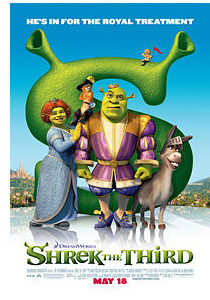 Shrek the Third is a 2007 computer animated comedy film of the Shrek series. It is the third film in the series, following Shrek and Shrek 2. It was produced by Jeffrey Katzenberg for DreamWorks Animation, and is distributed by Paramount Pictures, and was released in U.S. theaters on May 18, 2007 (June 22 in Spain, June 15 in Brazil, June 13 in France and June 29 in the UK and Ireland). It was produced with the working title of Shrek 3. Like the first two Shrek films, the movie is significantly based on fairy tale (specifically Grimm's Fairy Tales) themes. It's not easy being an ogre, but Shrek finds it doubly difficult for an ogre like himself to fill in for a king when his father-in-law King Harold of Far, Far Away falls ill in this third Shrek movie. Shrek's attempts to fulfill his kingly duties play like a blooper reel, with boat christenings and knighting ceremonies gone terribly wrong, and to say that Shrek (Mike Myers) is insecure about his new role is a gross understatement. When King Harold (John Cleese) passes away, Shrek sets out with Donkey (Eddie Murphy) and Puss-in-Boots (Antonio Banderas) to find Arthur (Justin Timberlake), the only heir in line for the throne besides himself. Just as Shrek sets sail to find Artie (as Arthur is more commonly known), Fiona (Cameron Diaz) shocks Shrek with the news that she's pregnant. Soon after, Prince Charming (Rupert Everett) sends Captain Hook (Ian McShane) in pursuit of Shrek and imprisons Fiona and her fellow Princesses as part of his plan to install himself as King of Far, Far Away. Shrek finds an awkward Artie jousting with his high school classmate Lancelot (John Krasinski) and, while Artie is certainly no picture of kingliness, Shrek is determined to drag him back to Far, Far Away to assume the throne. Mishaps and comedy abound, including a spell gone wrong that locks Donkey and Puss-in-Boots inside one another's bodies. While Fiona and the other Princesses prove they're anything but helpless women, Artie and Shrek battle their own fears of inadequacy in a struggle to discover their own self-worth. 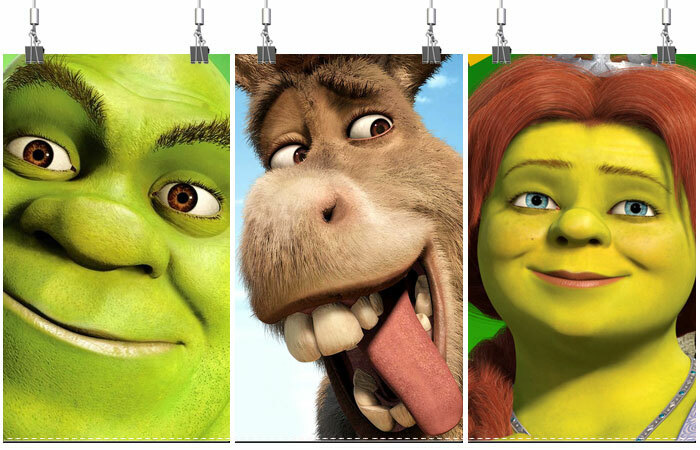 In the end, Shrek, Artie, and Fiona each learn a lot about their individual strengths and what truly makes each of them happy. Of course, it's the pervasive humor and wit that make Shrek the Third so side-splittingly appealing. 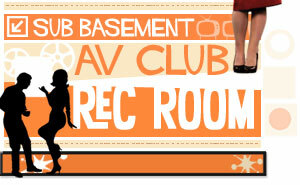 Rated PG for some crude and suggestive humor, but appropriate for most families with children ages 6 and older. 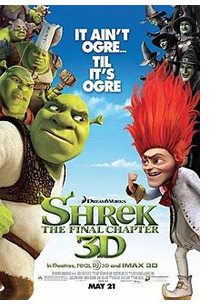 Shrek Forever After, taglined as The Final Chapter, also known as Shrek 4, is a 2010 animated fantasy-comedy film, and it is the fourth and final installment in the Shrek film series. Although the film received mixed to positive reviews from critics and opened lower than expectations, it remained as the #1 film in the United States and Canada for three consecutive weeks and has grossed a worldwide total of over $752 million, making it a commercial success. Additionally, the film is DreamWorks Animation's highest-grossing film at the foreign box office. The film begins just before Shrek and Donkey rescue Princess Fiona in the first film. Desperate to lift their daughter's curse, King Harold and Queen Lillian meet with con artist Rumpelstiltskin, who wishes to become king of Far Far Away in exchange. Before the deal is contracted, the king and queen learn that Fiona has been rescued. Rumpelstiltskin is then shown to have become washed up and bitter towards Shrek for inadvertently ruining his plans. Shrek has grown tired of being a family man and celebrity among the local villagers, leading him to yearn for the days when he felt like a "real ogre". He takes his family to Far Far Away to celebrate his children's first birthday. Shrek gets annoyed when the three little pigs eat the kids' cake and a boy demands that Shrek roar. After he lets out a frustrated roar the entire crowd cheers, reinforcing his belief that no one considers him a true ogre. After storming off, Shrek encounters Rumpelstiltskin, who offers to give Shrek a day to live like a real ogre in exchange for a day from his childhood he would not remember being erased. Shrek signs the contract and appears in a world where he is still feared by villagers. He enjoys causing mischief until he finds wanted posters for the ogress Fiona and his home deserted. He is captured by witches and taken to Rumpelstiltskin, now the king of Far Far Away, which has become derelict. Rumpelstiltskin uses ogres and some of Shrek's friends as slave labor. The day Rumpelstiltskin erased was the day Shrek was born. He never saved Fiona, and consequently Rumpelstiltskin got the King and Queen to sign their kingdom away. When the day ends, Shrek will fade from existence. Shrek escapes Rumpelstiltskin's castle with Donkey. Initially terrified of Shrek, Donkey decides to trust him after seeing Shrek cry over his lost past, something he never saw an ogre do before. After Shrek explains the situation, Donkey helps him find a loophole: the contract will be nullified if Shrek and Fiona share true love's kiss. Shrek and Donkey encounter a band of ogres who are resisting Rumpelstiltskin. The ogres are led by Fiona, who is still cursed after escaping from the tower where she was held captive, and keeps the retired and overweight Puss in Boots as a pet. Shrek does everything he can to gain Fiona's love, but she is too busy preparing an ambush on Rumpelstiltskin. She is also bitter and disillusioned about the power of true love and throws herself into planning Rumpelstiltskin's capture. While sparring with her, Fiona begins to like Shrek, but stops short of kissing him. 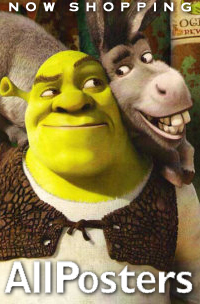 Shrek is discouraged, but Puss encourages him to continue pursuing Fiona. During the ambush, the ogres are captured by the Pied Piper. Shrek insists Fiona kiss him, saying it will fix everything, but because Fiona does not love him it is ineffective. Upon hearing that Rumpelstiltskin is offering anything desired by the one who captures Shrek, Shrek surrenders himself in exchange for all the ogres being released, but Fiona remains in custody because she is only an ogre by night. 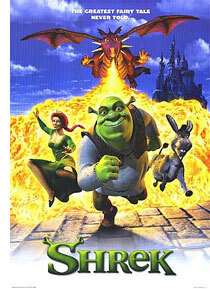 Shrek and Fiona are to be fed to Dragon, but Donkey, Puss and the ogres raid Rumpelstiltskin's castle, allowing Shrek and Fiona to subdue both Dragon and Rumpelstiltskin. As the sun rises Shrek begins to fade from existence, but Fiona, having fallen in love with him, kisses him just before he disappears, voiding the contract and restoring the world to just before Shrek originally lashed out at everyone. Shrek embraces his friends and family with newfound appreciation for everything he has, living happily forever after. Shrek is the protagonist from the children's book Shrek! and the films voiced by Mike Myers. The eponymous hero, who is an ogre, lives in a swamp and was, until befriending Donkey, a relative recluse and grumpy character. Although his background is something of a mystery, it is assumed that despite these traits, Shrek has always been an ogre of the non-hostile kind. Shrek's life was turned upside down, when, after meeting Donkey, his home (a wooden shack constructed from a large hollowed-out tree trunk) and land (a rather muddy swamp) were invaded by many fairy-tale creatures who were relocated there by Lord Farquaad. In order to reclaim his land, Shrek agrees to embark upon a mission to rescue Princess Fiona, Farquaad's bride-to-be, from a dragon. Shrek, although wholly successful in this mission, soon falls in love with the princess. Through fate or fortune, it transpires that he is her "one true love". She soon realises this, and after kissing Shrek magically transforms to an ogre, thus facilitating their marrying and living happily ever after. After the couple's honeymoon, the two visit Fiona's parents. Her father, under coercion, attempts to split the pair up, to fix Fiona up with Prince Charming. His effort is of no avail, though during this harrowing time, Shrek becomes extremely self conscious, and is transformed into a handsome human. Eventually changing back at Fiona's request, Shrek's belief in the priority of internal beauty is reaffirmed. Shrek has expressed rather philosophical observations on the similarities between Ogres and onions. He cooks a mean weed rat stew, and has a sense of humour that not all appreciate. His accent suggests Scottish descent. 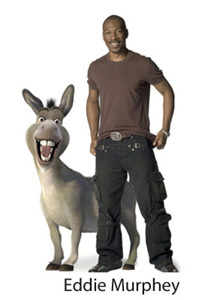 Donkey is a talking donkey from the Shrek movies voiced by Eddie Murphy. Little is known of Donkey's upbringing, or indeed of any of his life prior to his friendship with Shrek: owned by a somewhat unpleasent old lady, Donkey found his freedom after escaping while she was attempting to negotiate his handover to agents of Lord Farquaad. Directly after meeting Shrek, Donkey became involved in the rescue of Princess Fiona from Dragon, to whom he would later become attached. His support and friendship with Princess Fiona and Shrek are reckoned to have been instrumental in their subsequent relationship and marriage. Donkey is known to have a fear of rickety old bridges, enjoy parfaits, and be something of a hypochondriac. He is scrupulously honest, and enjoys singing. Some find him irritating, perhaps because they find his enthusiasm overarching. He does not have any toes, and is colorblind. 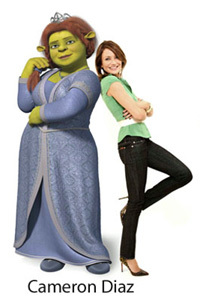 Princess Fiona is the Princess in the Shrek films with actress Cameron Diaz providing her voice. In the original film, Lord Farquaad sends the ogre, Shrek to retrieve her to be his bride. Through the course of the film, we discover that she is cursed, human by day and ogress by night until the end where she is kissed by Shrek and becomes permanently an ogress. It is revealed in a deleted scene that she was born with this condition, but drank a beauty potion to make her human self more beautiful. This was ultimately cut from the movie because it ruined the end. In Shrek 4-D, she is kidnapped by the ghost of Lord Farquaad, who intends to kill her, marry her, and become king of the Underworld. Shrek 2 features her trying to convince Shrek to meet her parents. They go, and her Fairy godmother, who had her locked away in the tower to begin with, plots to kill her husband so her son, Prince Charming can marry her. Princess Fiona is initially portrayed as the archetypal princess from fairy tales, speaking formally in matters of courtship and presenting high expectations of how she is to be rescued, who is to rescue her, and so forth. Later, Princess Fiona's true self emerges, as she's really a very down-to-earth woman who burps, belches, is a loyal friend, and unlike princesses of fairy tales, expertly fights in hand-to-hand combat with martial arts skills.